Here are your prints in shining armor! Today, a large part of our lives is being digitized -- it's the way forward. Not only does it help to save space, but it also helps to reduce wastage. This has allowed for the reduction of printed material. Many small offices now only use desktop printers or even smaller ones that come with similar features compared to the big, old heavy duty photocopy printers. Numerous homes and small offices could really use a good printer with advanced features, to make our lives easier. We check out the best printers in Malaysia for you. The Canon Pixma G3000 is the company’s first refillable ink tank system 3-in-1 printer. Specially designed to print big volumes at low costs, its bottles last up to 7000-page prints. The Pixma G3000 also supports mobile printing apps Canon PRINT Inkjet/SELPHY and PIXMA Cloud link. Built-in wireless LAN connectivity lets you control printing from your phone, tablets, and PC from anywhere while your printer is connected at home or in the office. You can have peace of mind knowing that your Pixma G3000 can scan, photocopy, or print for you very quickly and at a low cost. The M12W prints professional-quality output in a short period of time. It saves you a lot of time when it finishes up to 18 pieces per minute, so you can remain productive. You don’t have to wait long or stand by the printer like in the old days! Connected to WiFi, the 5.2KG M12W can be activated to print through the HP ePrint, Mopria or Apple AirPrint. With a large paper tray, you can enjoy the 600 dots per inch (DPI) quality prints without having to refill paper as often. It can hold up to 150 sheets of paper. This multifunction ink printer prints at 27ppm in mono and 10ppm in colour. The InkBenefit DCP-J100 is ideal for use both at home, and in a small office. You can print documents, images, photos and even on envelops with this 7.1KG printer. This Brother’s laminated piezo print heads are made to be more durable, saving you money in the long run from maintenance costs. Black ink cartridges yield up to 2400 pages each, so go ahead and print, scan, and copy away. Have your own business and find that you need to print documents often? The Epson L1800 is the perfect printer for your home; it even prints in A3 size, a handy feature — especially if you need to get those designs or charts in 1 piece. The ink tank is large enough to print up to 1800 (10 X 15cm) photos, and when you finally do have to refill, it is a simple and mess-free process with its clear labelling and drip-free nozzle. The L1800 can print up to 15 pages per minute, and its tray can hold 50 pieces of paper. Dot matrix printers, also known as impact printers, are less common in the market but nonetheless, still perform exceedingly well. This 24-pin printer is hardy, with impressive speeds to live up to your expectations. The LQ-310 is durable and its mean time of 10,000 power-on hours should last you a very long time. It weighs 4.1KG and it can also print on continuous and roll paper. 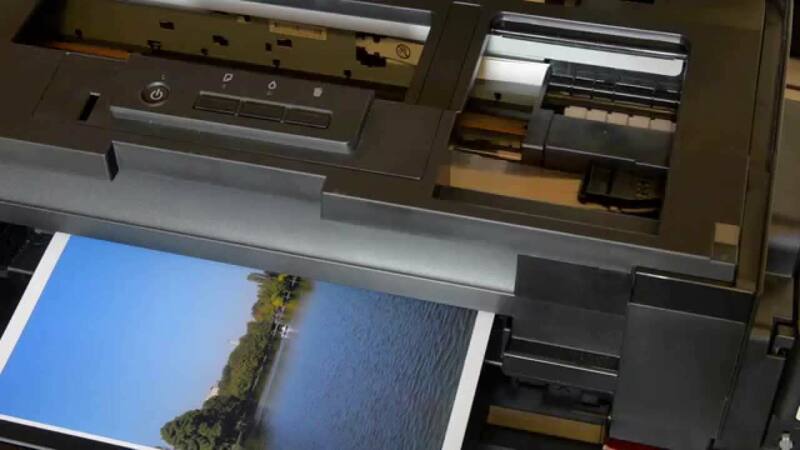 Ever wanted to be able to print photos wherever you are? The HP Sprocket is a handy printer that can be carried with you anywhere. It’s also super light, weighing just 172 grams. Just charge up the device fully in slightly over an hour, and you’re good to go. Download the Sprocket mobile app and you’ll be able to select the best photos from your phone to print. But wait, you can also add text, emojis, and borders to beautify it. The photos will make lovely souvenirs. The Sprocket comes with a 10-sheet pack of photo papers. If you need high-quality prints at your fingertips, then the Pixma TS9170 the printer for you. This all-in-one inkjet printer lets you print, scan, and copy, making life so much easier. Be amazed by the improved colour reproduction with the 6-ink system, bringing out more vivid colours. It comes with a full touchscreen display panel to keep things simple and smooth. The auto duplex printing even helps you to save paper by printing on both sides. You can also choose creative filters and enhance the photos before printing. The Pixma MG2570S is an affordable 3-in-1 printer which connects via a high-speed USB 2.0 port. It has basic printing, scanning and copying functions that will get the job done if you’re not expecting outstanding quality. Its compact and lightweight design let you keep the printer on shelves or narrower spots to avoid taking up too much space in your home – it weighs only 3.5KG. The Auto-ON function switches the printer on when it receives a print command.